The Melbourne Cricket Ground hosts an ODI match between Australia and India. The two players in yellow are the batsmen and those in blue are the fielding team. Limited overs cricket, also known as one-day cricket, which includes List A cricket and Twenty20 cricket, is a version of the sport of cricket in which a match is generally completed in one day, whereas Test and first-class matches can take up to five days to complete. The name reflects the rule that in the match each team bowls a set maximum number of overs, usually between 20 and 50, although shorter and longer forms of limited overs cricket have been played. One-day cricket is popular with spectators as it can encourage aggressive, risky, entertaining batting, often results in cliffhanger endings, and ensures that a spectator can watch an entire match without committing to five days of continuous attendance. Each team bats only once, and each innings is limited to a set number of overs, usually fifty in a One Day International and between forty and sixty in a List A. List A is a classification of the limited-overs (one-day) form of cricket, technically as the domestic level. Despite its name, important one-day matches, international and domestic, often have two days set aside, the second day being a "reserve" day to allow more chance of the game being completed if a result is not possible on the first day (for instance if play is prevented or interrupted by rain). As mentioned above, in almost all competitive one-day games, a restriction is placed on the number of overs that may be bowled by any one bowler. This is to prevent a side playing two top-class bowlers with extremely good stamina who can bowl throughout their opponents' innings. The usual limitation is set so that a side must include at least five players who bowl. For example, the usual limit for twenty-over cricket is four overs per bowler, for forty-over cricket eight per bowler and for fifty-over cricket ten per bowler. There are exceptions: Pro Cricket in the United States restricted bowlers to five overs each, thus leaving a side requiring only four bowlers. The idea for a one-day, limited 50-over cricket tournament, was first played in the inaugural match of the All India Pooja Cricket Tournament in 1951 in the small town of Thrippunithura in Kerala. It is thought to be the brain child of KV Kelappan Thampuran, a former cricketer and the first Secretary of the Kerala Cricket Association. The one day limited over cricket game was later adapted and played between English county teams for the first instance on 2 May 1962. Leicestershire beat Derbyshire and Northamptonshire beat Nottinghamshire over 65 overs in the "Midlands Knock-Out Cup", which Northamptonshire went on to win a week later. The following year, the first full-scale one-day competition between first-class teams was played, the knock-out Gillette Cup, won by Sussex. The number of overs was reduced to 60 for the 1964 season. League one-day cricket also began in England, when the John Player Sunday League was started in 1969 with forty over matches. Both these competitions have continued every season since inauguration, though the sponsorship has changed. There is now one 50 over competition, which is called the Royal London One-Day Cup. 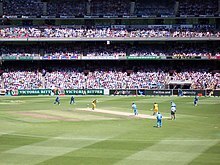 The first Limited Overs International (LOI) or One-Day International (ODI) match was played in Melbourne in 1971, and the quadrennial cricket World Cup began in 1975. Many of the "packaging" innovations, such as coloured clothing, were as a result of World Series Cricket, a "rebel" series set up outside the cricketing establishment by Australian entrepreneur Kerry Packer. For more details, see History of cricket. Twenty20, a curtailed form of one-day cricket with 20 overs per side, was first played in England in 2003. It has proven very popular, and several Twenty20 matches have been played between national teams. It makes several changes to the usual laws of cricket, including the addition of a "bowl-out" (similar to a penalty shoot-out in football) to decide the result of tied matches, which was subsequently dispensed in favour of a Super Over. 100-ball cricket, another form of one-day cricket with 100 deliveries per side, will launch in England in 2020. It is designed to further shorten game time and hopes to attract a new audience. It makes further changes to the usual laws of cricket, including the addition of one 10-ball over which is bowled by each side in addition to 15 traditional 6-ball overs. One Day International matches are usually played in brightly coloured clothing often in a "day-night" format where the first innings of the day occurs in the afternoon and the second occurs under stadium lights. Every four years, the Cricket World Cup involves all the Test-playing nations and other national sides who qualify through the ICC World Cup Qualifier. It usually consists of round-robin stages, followed by semi-finals and a final. The International Cricket Council (ICC) determines the venue far in advance. The ICC Champions Trophy also involves all the Test-playing nations, and is held between World Cups. It usually consists of a round-robin group stage, semifinals, and a final. Each Test-playing country often hosts triangular tournaments, between the host nation and two touring sides. There is usually a round-robin group stage, and then the leading two teams play each other in a final, or sometimes a best-of-three final. When there is only one touring side, there is still often a best-of-five or best-of-seven series of limited overs matches. The ICC World Cricket League is an ODI competition for national teams with Associate or Affiliate status. Domestic one-day competitions exist in almost every country where cricket is played. List A cricket is a classification of the limited-overs (one-day) form of the sport of cricket. Much as domestic first-class cricket is the level below international Test match cricket, so List A cricket is the domestic level of one-day cricket below One Day Internationals. Twenty20 matches do not qualify for the present. Most cricketing nations have some form of domestic List A competition. The number of overs in List A cricket ranges from forty to sixty overs per side. The Association of Cricket Statisticians and Historians created this category for the purpose of providing an equivalent to first-class cricket, to allow the generation of career records and statistics for comparable one-day matches. Only the more important one-day competitions in each country, plus matches against a touring Test team, are included. The categorisation of cricket matches as "List A" was not officially endorsed by the International Cricket Council until 2006, when the ICC announced that it and its member associations would be determining this classification in a manner similar to that done for first class matches. The One-Day Cup is a fifty-over limited overs cricket competition for the English first-class counties. It replaces the ECB 40 from 2014 onwards, increasing the number of overs from 40 to 50 in order to bring the competition in line with One Day Internationals. The competition consists of two groups of nine teams, from which the top four teams from each group progress to the quarter-finals. Lord's hosted the inaugural final of the competition on Saturday 20 September 2014. Unlike in the previous competition neither the national teams of Scotland or the Netherlands, nor the Unicorns cricket team—a team formed of players who do not have first-class contracts—will participate in the competition. One-Day Cup games have List A status. The t20 Blast is a Twenty20 cricket league in England and Wales run by the ECB since 2014. The league consists of the 18 first-class county teams divided into two divisions of nine teams each, the top four teams from each group entering the knockout stage. The inaugural tournament was won by Birmingham Bears. This tournament replaced the Friends Life t20 as the premier domestic Twenty20 competition of England and Wales. The Hundred is the working title of an upcoming domestic city based 100-ball league due to launch in 2020. Ranji Trophy onedays – The teams in the five zones play each other and the zonal winners play in a round-robin format. NKP Salve Challenger Trophy – Three teams are involved – each team comprising a motley of players picked from across the country. The three teams are named India seniors, India A and India B or India Reds, India Greens and India Blues. Indian Cricket League – A Twenty20 league bankrolled by billionaire Subhash Chandra and run independently of the country's governing body, the Board of Control for Cricket in India (BCCI). Launched in 2007 with teams in Mumbai, Chennai, Chandigarh, Hyderabad, Kolkata and Delhi. It was closed down in 2009. Men's: The Ford Trophy is played annually between six teams based upon the first-class associations: Northern Knights, Auckland Aces, Central Stags, Wellington Firebirds, Canterbury Wizards and Otago Volts. Its name and format have changed over the years; it was first played in 1971-72 as the "New Zealand Motor Corporation Knockout Tournament". It is now played as a double round-robin (home and away) with team 1 gaining direct entry to the final and teams 2 and 3 contesting a semi-final. Games are played to ODI rules with many day-night matches. Women's: The Hallyburton Johnstone Shield is played annually between six teams based upon the first-class associations: Northern Spirit, Auckland Hearts, Central Hinds, Wellington Blaze, Canterbury Magicians, Otago Sparks. The format is a double-round-robin with the winner determined by points. NATIONAL BANK Cup: A two-week tournament in February and March between city teams, divided into the Gold League (with seven teams) and Silver League (with six teams). The teams play each other once, with the top two teams qualifying for the final in each individual League, so no team from the Gold League will meet a Silver League team. NATIONAL BANK Twenty20 Cup: A tournament running one week in mid-March. The same groups apply as in the NATIONAL BANK Cup, and there will be two semi-finals and a final following the group stages. The tournament will be held in Karachi and Lahore. The games are 45-overs, and based on a home-and-away round-robin match system (each team plays ten matches) with semi-finals and a final. The Eagles were the winners of the 2004/2005 and 2005/2006 competitions. The NAGICO Regional Super50 is the main regional one-day competition in the West Indies. In recent years, it has been run over a week's time as a group stage followed by knock-out stages. Trinidad and Tobago have won the most titles. The world record for the highest innings total in any List A limited overs match is 496 for 4 by Surrey against Gloucestershire in their Friends Provident Trophy 50-overs match at the Oval, London on 29 April 2007. That surpassed the 443 for nine by Sri Lanka against the Netherlands in their One Day International 50-overs match at Amstelveen on 4 July 2006, which was the record ODI score at the time. On 19 June 2018, England set a new international record, totalling 481 for 6 against Australia at Trent Bridge. The lowest ever total is 23 by Yorkshire against Middlesex at Headingley in 1974 in a 40-overs match. The record low score in ODIs was set by Zimbabwe, who managed just 35 against Sri Lanka in Harare on 25 April 2004. The most runs scored by both sides in any List A limited overs match is 872: Australia, batting first, scored 434 for four in 50 overs, and yet were beaten by South Africa who scored 438 for nine with a ball to spare during their One Day International at Johannesburg in 2006. The highest individual innings is 268 by Ali Brown for Surrey against Glamorgan in a 50-overs match at The Oval in 2002. The best bowling figures are eight for 15 by Rahul Sanghvi for Delhi against Himachal Pradesh in a 50-overs match at Una in 1997. The highest international individual innings is by Rohit Sharma who scored 264. The highest score in any formal limited overs match is believed to be United's 630 for five against Bay Area in a 45 overs match at Richmond, California in August 2006. The most runs in an over was scored by Herschelle Gibbs of the South African cricket team when, in the 2007 Cricket World Cup in the West Indies, he hit 6 sixes in one over bowled by Daan van Bunge of the Netherlands. This record is shared by Yuvraj Singh of India who achieved this feat in the 2007 ICC World Twenty20 in South Africa, he hit 6 sixes in an over bowled by Stuart Broad of England. Sachin Tendulkar holds the record of being the first male cricketer to score a double century in ODIs (200 not out). He achieved this feat against South Africa on 24 February 2010, at Gwalior, India. Virender Sehwag is the second male cricketer to score a double century, when he scored 219 before being caught out against West Indies on 8 December 2011, at Indore, India. Rohit Sharma became the third male cricketer to score a double century, when he scored 209 against Australia on 2 November 2013. ^ "World's first limited over tournament turns 60". ^ "Herschelle Gibbs smashes a record six sixes in an over". Cricinfo. 16 March 2007. Gilchrist, Adam (1999). One-Day Cricket: Playing the One-Day Game. Harper Collins Publishers. ISBN 0-7322-6713-7.